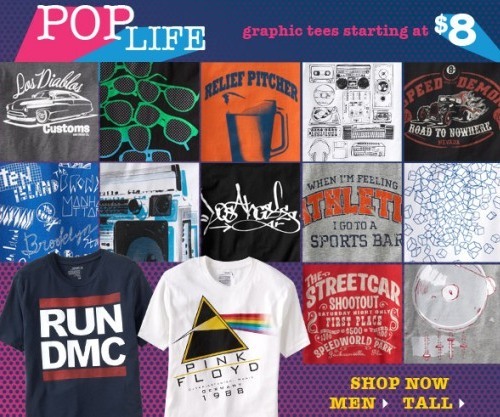 Shop for men's graphic tees at Old Navy. You will find pop culture graphic tees, varsity graphic tees, music relevant tees, logo tees, style statement tees and much more. You can even find location tees such as New York Borough graphic tees, Los Angeles tees etc. The assortment at Old Navy rapidly changes as they try to maintain the latest fashion trends. Therefore, you should check their site often to see what is currently being offered. Step out and stand out in their cool men's graphic tees. From sporty to smart-alecky, they have the graphic tees that men want. Soft cotton jersey and a rib-knit crew neck make them a comfort classic, perfect for a laidback weekend. Go for the classic logo tee or mix it up with their edgy catchphrase graphic tees and get the conversation started. Hit the beach with a surf-inspired tee or get into the game with their team-style graphic tees. There's a great graphic tee for every one. And with the graphic look turning up on everything from tees and polos to sweatshirts and pullovers, there's never been a better time to get graphic. Old Navy is a division of the Gap. Read more news about the Gap. Read more men's fashion news.